As a child, my mother used to make delicious orange and date muffins, and these conjured up memories of those. 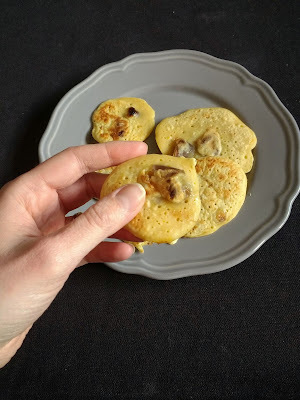 I may turn my attention to a muffin version soon but for now, pikelets provide a quicker way of conjuring up the classic orange-date flavours. It was only after making these that I discovered a similar recipe I posted on here 3 years ago (orange and date drop scones). I suspect as time goes on I will accidentally re-create more recipes, forgetting what I have done in the past. This version is slightly simpler than my 2015 one but there isn't much in it. We ate these as snacks but they could provide an on-the-go breakfast too. Oil, if needed, for cooking. Whisk together the flour and baking powder in a large bowl. Add the orange juice and zest, chopped dates, and milk. Stir until fully combined. Set the batter aside while you heat a non-stick pan over medium-high heat. 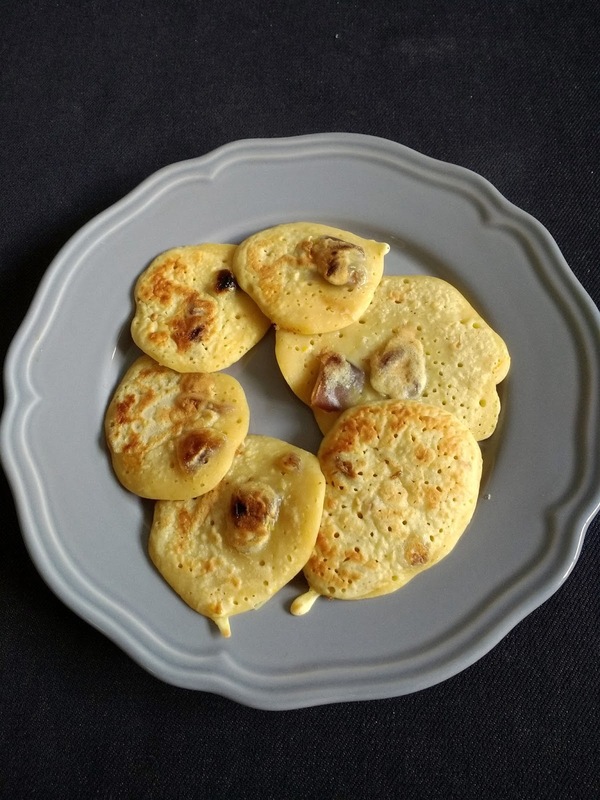 When the pan is hot, transfer dessertspoon-sized scoops of batter into the pan (I cooked 4 pikelets at a time). Cook for 3 or so minutes until bubbles appear on the surface, then flip and cook for a further 3 or so minutes until both sides are golden brown. Repeat for the remaining batter. What are you snacking on this week? These sound lovely. I have made recipes and found I have blogged very similar ones before but the context changes and so do the photos even if the recipes are similar. Pikelets are always a hit in our house too. I love the additions you've added though. Funny about the re-posting of similar recipes. I think we are drawn to favourite flavour combinations so it's almost inevitable! I suppose it's a good sign really - classic flavours and all that! I love pikelets, though more often than not in a savoury way. I really like the sound of orange and date together. I hope you got to enjoy them with the good weather! These sound great. I love pikelets.